A new office building and parking garage at Costco’s Issaquah campus could make room for as many as 4,000 employees as the club retailer seeks to consolidate and create some breathing room at its longtime corporate headquarters. Costco earlier this month received a final land-use approval from the city of Issaquah for a nine-story, 620,000-square-foot office building and adjacent parking garage with about 1,650 stalls, both to be built on existing parking lots south of the company’s current headquarters buildings, said Seattle-based architecture firm MG2, which is designing the project. It’s hard to get a firm employment tally for Costco in the city, which includes one of its stores as well as the headquarters. 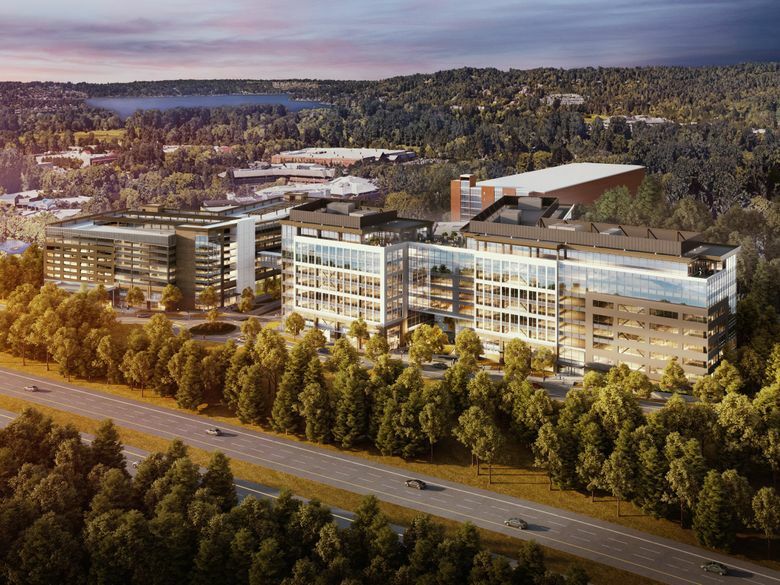 In addition to workers at the headquarters campus itself, about 2,000 corporate employees are working at other sites nearby, and the new office would accommodate them as well as future growth, according to documents submitted to the Issaquah development commission. The company did not respond to questions about its headquarters plans or employment numbers in Issaquah. The approval comes four years after Costco and Issaquah entered a 30-year development agreement granting the company rights to grow by as much as 1.5 million square feet, said Keith Niven, economic and development services director at the city. Costco is by far the biggest employer in the Seattle suburb. The retailer moved its headquarters to Issaquah in 1994. “If you’re a city, especially as Amazon’s floating out their HQ2 proposal to the world, you say, ‘How do we keep our biggest employer in town,'” Niven said. Among the stipulations in the development agreement are commitments by Costco to fund half the cost of three road projects in the vicinity of its campus. The projects dovetail with a broader redevelopment plan designed to shift central Issaquah from the lower-density suburban retail outlets of today to a more dense mix of businesses, stores and housing. On the far horizon is the expected arrival, in 2041, of light rail. Niven said construction on the new Costco buildings is expected to begin next year with the company targeting occupancy in 2020. This story was updated Thursday, Oct. 25 at 1:50 p.m. to correct the spelling of Niven’s surname.